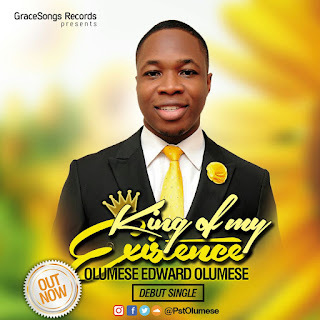 Amazing Grace Church's Lead Pastor, Olumese Edward Olumese makes his first appearance with his debut single titled King of my Existence. "As i look at my life today and reminisce on how much God has led me through His Spirit, I am humbled. The song was birthed in my spirit as i contemplated on God's extreme goodness to me. It is a song of devotion and absolute commitment to God's purpose for my life. I am certain that by its words, you will be transported to higher realms of consecration. With joy in my heart, I present to you... King Of My Exisitence" - Pst. Olumese. The song was produced by T-One.